Start a new family tradition by tagging your gifts with reusable gift tags. Make one for each member of the family which can be used year after year! Customize to Buy your Re-usable Gift Tag now! Stocking stuffers, tree ornaments, even re-usable gift tags... Dogtags are a versatile holiday Xmas item! 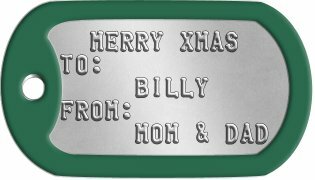 Personalized dogtags make a great low cost, thoughtful holiday gift. Ideal for military spouses, runners, mil-sim and paintball enthusiasts, teams, medical ID, boyfriends/girlfriends/bffs, scuba, hunters, fishermen, golfers, Christians, pets, gamers, etc. Use your imagination to make the perfect customized gift they will love! At MyDogtag.com, we provide premium quality mil-spec Dog Tags that will last a lifetime. They are completely customizable so you can easily create your dog tag for a particular use or occasion; A Dogtag is like a blank canvas, whatever you want to put on it, we can make it, we can even laser engrave your custom logo or image! Choose your Dog Tag style & font, write your custom message, choose your chains, colored silencers, & gift box and then see a preview of what your finished dog tag set will look like before we actually make it! All orders are shipped within 1 business day and are usually delivered within 1 week (in North America). If you need any assistance creating or ordering your Re-usable Gift Tag please contact us directly, we are here to help! More Questions and Info about our Dog tags. What are the specs of the dogtags do you offer? What's the difference between Embossed and Debossed? What Chain sizes and fasteners are available? Why do some dogtags not come with silencers? What can I put on my Dogtags? What characters are allowed on my tag? How can I fit more characters on my Dogtag? Do you make BRAILLE dogtags? Are these real military dog tags? Why are two tags issued in each set? Can I order only one? How do you make your dogtags? 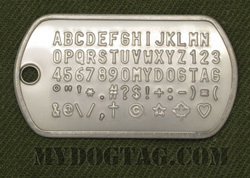 Are dogtags suitable for small children? What are the official specifications for USA Military Dogtags? What are the official specifications for Canadian ID Discs? Where can I learn more about dogtags?